Paul Kulniszewski of Lockport, NY found more than the Virgin Mary when he cut open an orange. He found her with her son, Jesus, hanging on the cross. I must admit, this is a juicy one. Orange you glad you said “Jesus”? If you cut the orange at a different angle, Jesus looks like a Jack in the Box and Mary appears to be shoving pies into a pizza oven. I guess it all depends on how you slice it. Hmmmm….I see Cheerleading Jesus…Gimme a J! The owner has preserved the orange in resin, but will not sell it. Kulniszewski says he knows there are people out there who will think he is crazy but says, he knows what he sees. I know what I see, too. 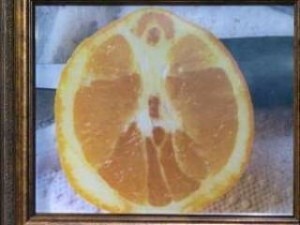 I see an orange with the image of the Virgin Mary and Jesus on her shoulders. What we see, or more to the point what we perceive, is an image. It is not a person or a spirit. It never is. If Jesus was standing in front of you, what allows you to see him is a pattern of electromagnetic energy (light) which bounces off of him and enters your eye, is consumed by receptors in your retina, converted to electrochemical energy and, through a series of electrochemical processes in the brain, perceived as Jesus. The same thing occurs with all patterns. So, like Kulniszewski, I see an orange with an image. The difference between he and I is that he believes the orange is magical while I believe it is an orange. Kulnisnewski plans to duplicate the picture of the orange and sell it for around $15.00 including shipping. He says half of the proceeds will go towards his Roman Catholic Church in Lockport. Wow. I can see it for free on the internet. And let’s not forget this one that I somehow missed. Lisa Swinton found Ray Comfort’s dream date at the bottom of her fruit bowl. She saw Jesus, too, but she ate the banana and tossed the peel after taking this great picture of it. 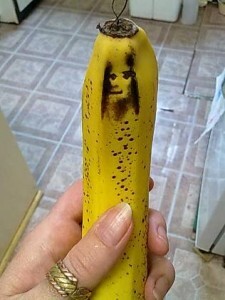 She says the banana did not look like that when she bought it and suspects that the fruit sitting on it made the bruise. Smart woman. I guess she was more interested in a snack with integrity than the large sum of cash she could have acquired by selling the banana on Ebay. Thanks go to Barry Karr for both of these gems.